ca. 1966 to ca. 1973? Billy Thorpe: "(It) had once been the home of the Public Schoolboys' Club. It was run by Tony Knight, the son of a very successful catering family. A handsome flamboyant character who sat at the front door four nights a week dressed to the nines in velvet and lace, Tony embodied the elegance of the "Mod" Edwardian style that had becaome so poular in Carnaby Street in the late '60s. Bertie's was without doubt the best live music club Australia has ever had, Unlike the Whiskey, which was Australia's most successful licenced club, Bertie's -- like all Melbourne venues except the pubs -- didn't sell alcohol.. Bertie's was all about local live music and people came in droves simply because of the bands and the vibe." Berties was a magnet for the best Australian bands in the late 60s. Cam-Pact played there regularly, The La De Das played there on their first visit to Melbourne in August 1967. The Twilights played at Berties many times, including a famous residency in the Australian autumn of 1967, following their return from the UK, when (to the consternation of EMI executives) they performed show-stopping live rendtitions of the entire Sgt Pepper's album, which was still away weeks from its Australian release. Another famous Berties event in December 1967 was the 'comeback' concert by the still-recuperating Max Merritt & The Meteors. This was their first public performance since a near-fatal crash near Morwell, Vic. in July that year in which Merritt, drummer Stewie Speer and sax player Bob Birtles were all seriously injured, and it would be their only gig in the second half of 1967. 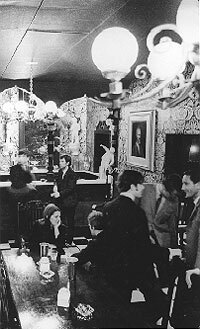 On 3 September 1968 Berties was the scene of the famous media reception for ex Adelaide band Zoot. For the occasion Berties was decked out the disco completely in pink, including pink champagne and pink carnations. The party was organised by Knight and Berties manager Wayne De Gruchy, who had also just taken over management of Zoot. The reception was the launch of the band's "Think Pink - Think Zoot" publicity campaign, part of their new image as a fully-fledged "bubblegum" act. The band members were decked out with matching pink suits and pink guitars, and even Daryl Cotton's luckless Afghan hound, Monty, was dyed pink for the event. Although the group loathed the image -- they later ritually burned the hated pink outfits on UpTight -- the event itself seems to have been a promotional success and their next single "1x2x3x4" was a Top 40 hit in Melbourne. Berties appears in the Twilights' 1968 TV special Once Upon A Twilight, where its opulent foyer was used as the location for the Twilights' office. The show was a half-hour pilot for a proposed Monkees-style TV series, but it was never made because the main sponsor, the Ford motor company, lost interest in the project and withdrew its support. Please email webmaster@milesago.comifyou have more information or corrections, or to report any broken links.